I’m generally not that sentimental of a guy. It isn’t often that I think about how short life is and how lucky I’ve been. But being in the middle of the Christchurch earthquake a few weeks ago has really caused me to take time to reflect. One thought that has gone through my head countless times – and I’m sure through the heads of thousands of others from Christchurch – is ‘It could have been me’. I could’ve gone out to get lunch 30 minutes later than I did. I could have decided to go to the top of the Cathedral that day. I could’ve been parking my car out front of my hostel – as I’d done multiple times before. I could have stayed in a different building. One that came down. Thankfully I was incredibly, incredibly lucky. Especially considering I was in the City Centre when it happened. I was inside a sound building that wasn’t damaged. But I walked outside to what felt like a war zone. 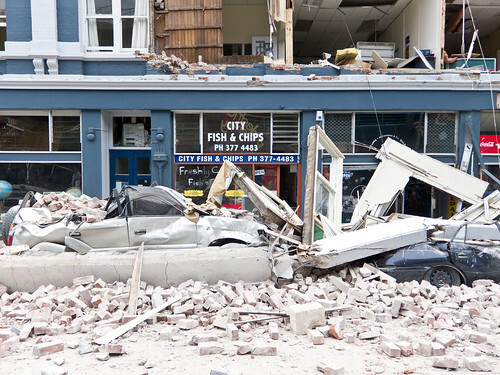 The photo above was taken of the building immediately to the left of where I was when the quake hit. I’d parked my car in that exact spot before. Take a few minutes today to think about life. For all the difficulties we face, we’re lucky in the grand scheme of things. Call a loved one. Think about what makes you lucky. Just take 5 minutes to be glad we are among those that get a second chance. This entry was posted on Thursday, March 10th, 2011 at 2:01 pm. It is filed under Photography, POTD, Thoughts. You can follow any responses to this entry through the RSS 2.0 feed.